Three weeks ago, the authorities caught up with Mr Previous Tenant and despite my protests that I was not him and knew nothing about this, sealed our gas supply shut. Luckily I had a cute little butane camping stove, so we weren’t entirely without heat to cook. Finally, after many, many maddening trips to various offices we were promised a visit from the technician. The bell rang, a man asked for the previous tenant by name, I said yes, let him and we had gas again. The timing of the disconnection was such that my previous loaf of bread was barely a crust. 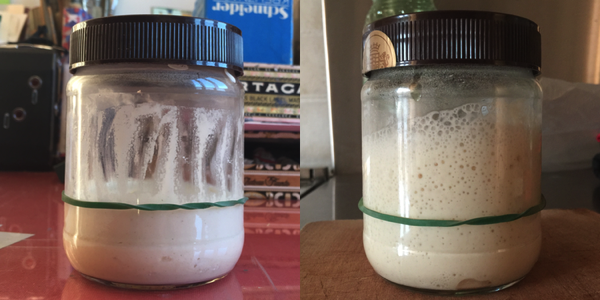 As a result, we’ve had to make do with store-bought bread and my starters had to survive a month or more of neglect. First order of the day, then, was to build one of the starters for a loaf. Alas, temperatures have plunged this week, and although we had gas, we did not have central heating, so it sat there morosely on the counter. I’m generally against pampering my starters and dough, but this was an exception, so I wrapped it up nice and warm in a styrofoam box with one of those gel packs that you can either freeze or boil, and it came good. 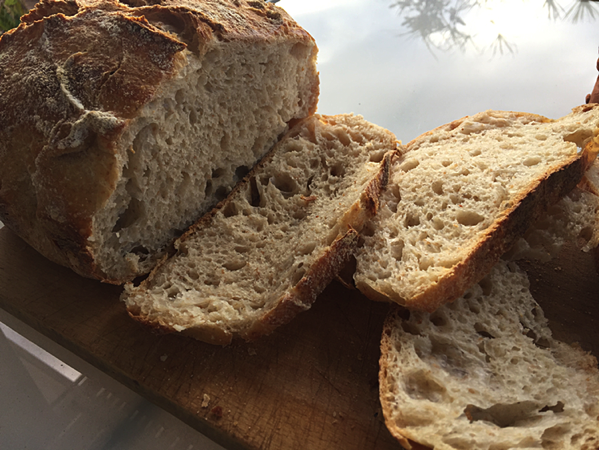 I made a single portion of a basic white sourdough bread, with 10% wholewheat and 70% hydration. That was when I realised that I would have no time to bake over the following two days. The dough went into the fridge, after a couple of stretch-and-folds, and there it stayed from Wednesday night to Friday night. Late last night I took it out of the fridge, shaped it gently and put it into a banneton to warm up and rise overnight. That it certainly did, and what I hadn’t reckoned with was that it had sat so long in the banneton that it stuck fairly firmly to the lining. 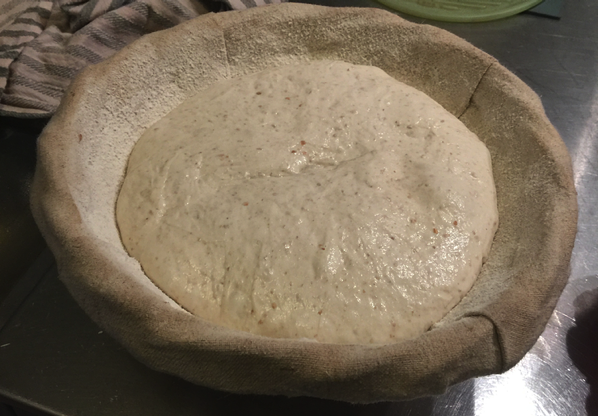 After a bit of a struggle I managed to release it by gently rolling the surface of the dough off the linen. As it dropped onto the parchment it sank in on itself and so did my hopes. Still, there it was. The oven was hot and the Dutch oven ready, so what the heck. 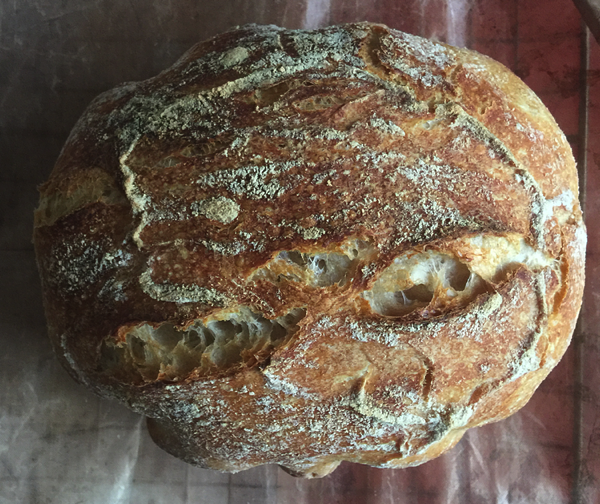 What a very pleasant surprise the finished loaf turned out to be. Tasty too. In fact, apart from the extended second rise and consequent sticking, I am very tempted to do a 48 hour bulk ferment again on purpose.